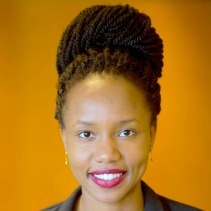 Rose is a first year student pursuing a MS in Foreign Services at Georgetown University's Walsh School of Foreign Service, where she is studying Global Politics and Security. She is also a refugee from Kigali, Rwanda. During the Genocide in Rwanda, her family fled Kigali and spent years walking across Congo to escape conflict. Growing up in refugee camps, sleeping in tents and sometimes having nothing to eat, has shaped the person she is and her ambitions in life. Today Rose's dream is to finish her studies with a degree in Foreign Service and work for the United Nations, UNICEF, or other International Aid agency. Rose is excited to continue her Journey from refugee to an agent for conflict resolution and social change. At Georgetown University, she is enriching the insight necessary to help her realize her career and life goals of providing service to refugee and immigrant communities in need. Rose's goal is to be the symbol of unity. She is a woman who is doing something that most women where she comes from are unable to achieve due to the many obstacles they face. She speaks five languages: Kinyarwanda - her mother language, Lingala, French, English and Spanish. Rose wants to use her language skills and understanding of different cultures to bring together people of different ethnicities and backgrounds. After her fellowship, Rose wrote: "Women and children are very valuable to society yet they are the most vulnerable in times of crisis. Protecting them, and giving them access to education, medical care, and opportunities to become independent and live a flourished life, should be the duty of each one of us." Improve the smell of the soap or don’t come back! When Time is Your Worst Enemy: Two Weeks Left and a Lot Left To Do. Poverty Worse Than Terrorism in Mali: C’est La Misère Ici! It was a long way to Bamako but it was worth it.